I randomly decided to learn how to make sushi and somehow Star Wars haunted me every step of the way (it must have been the Force…naturally). This cooking adventure started because the online recipes I found didn’t look too difficult and given endless sushi filling possibilities, it was also a great food know-how to add to my “newly vegetarian” arsenal. My parents also gifted me a spiffy Zojirushi rice cooker years ago that has a “Sushi” button, so I had no fears there either. However, after years of making spring rolls, I knew how deceptively simple this all seemed to be. Was the Force really with me? I should have known the theme when Yoda made an appearance in the chaos. I had decided initially on teriyaki tofu as a filling, but then thought to add in shiitake mushrooms and then remembered I had just a little bit of spinach left…okay – so perhaps this wasn’t my most well-planned and strategic food adventure. In the midst of making these fillings, my rice completed cooking. Turns out my spiffy rice cooker makes sushi rice the same as regular white rice – just that I use medium rice grain. However, sushi rice requires the addition of rice vinegar, sugar, and salt after it’s been cooked. My rice cooker’s instructions for sushi rice actually calls for using a fan to help speed up the cooling process while mixing. 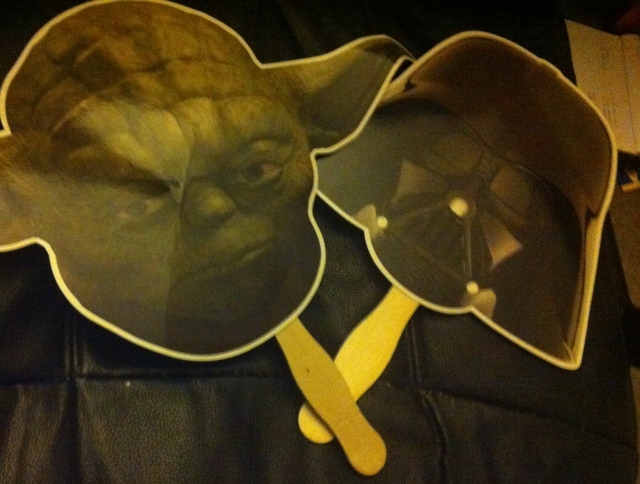 Thinking I didn’t have a fan, I initially attempted this process without one – but then remembered I had two: two Star Wars paper fans from Comic-Con 2011. They were free hand-outs for the Blu-Ray release of the saga. Here’s the thing about these fans: one is Yoda and the other is Darth Vader. So I stood for a nerdtastic second actually divided between the Dark Side and the Light Side. I chose Yoda figuring Darth Vader’s cyberengineering didn’t preach to any culinary positives on his part – let alone the assurance that post-Anakin he actually ate real food. So there I was fanning rice with a Yoda fan, contemplating the fact that despite all this work, I hadn’t gotten to the part of sushi-making that I knew would be a challenge: the actual balance of filling the roll and making a sushi roll. Talk about needing the Force – not to mention, the whole Do or Do Not There is No Try business. A few possible names: “The Not Taco”, “The Sushi Mini Subway”, “The Almost Accidental Hand Roll”. I realized I learned a lot from the first attempt. I had an introduction to how to handle the very sticky sushi rice and get used to laying it out on the nori/seaweed. I also learned to decrease the amount of filling and how to improve on the rolling technique. It wasn’t perfect, but at least there was a semi-decent roll! This second round might have also turned out better except that my knife wasn’t very sharp – making the cutting process not my finest moment.Of course, the closing moral of the story would be: you never know when you need some form of lightsaber. Loved the spur of the moment kind of thought “hey I have a Yoda fan I can use!” It does warm my heart to think our conversations still come into your thoughts on occasion, even if you need a nudge from the Force. Great work as always!